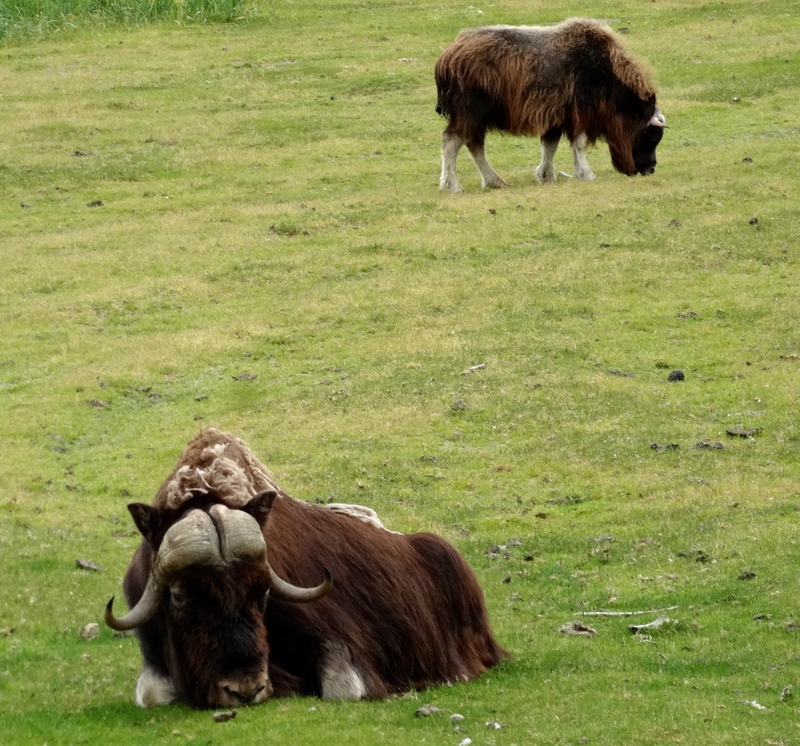 On our way to Whittier we stopped at the Alaska Wildlife Conservation Center. The Center provides a home for animals that were either rescued due to injury or because they were found orphaned at a very young age and have little chance for survival in the wild. 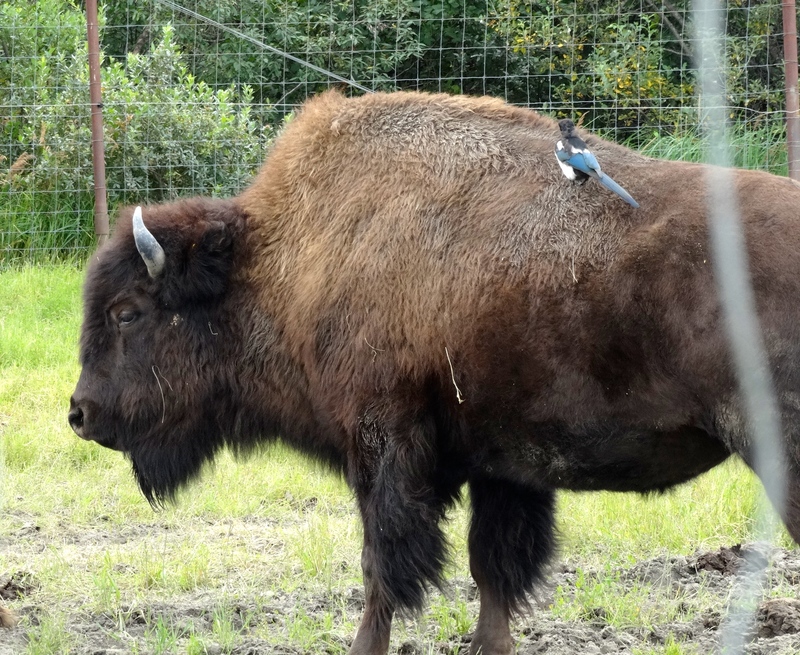 One of the exceptions is the wood bison program which is run in cooperation with Canada with a mission to restore the wood bison to their former Alaskan habitat. This is the only wood bison herd in the United States. 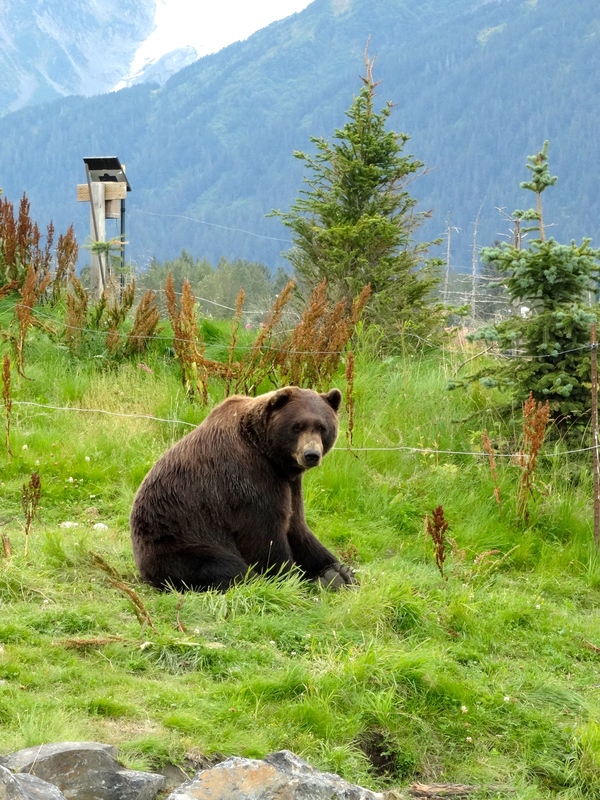 The conservationists expect to release them into an area in the interior of Alaska sometime in March, 2015. At the center are three grizzlies, a couple of black bears, porcupine, moose, musk ox, reindeer a bald eagle, caribou, a fox, a pair of lynx and sitka black tailed deer. 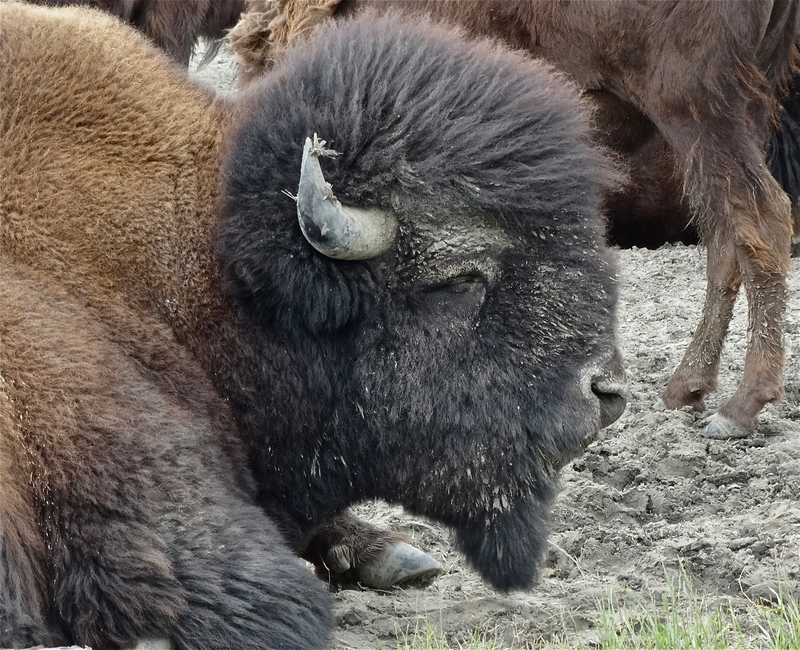 Weighing in at around 2,250 pounds, the wood bison is the largest land mammal in North America. 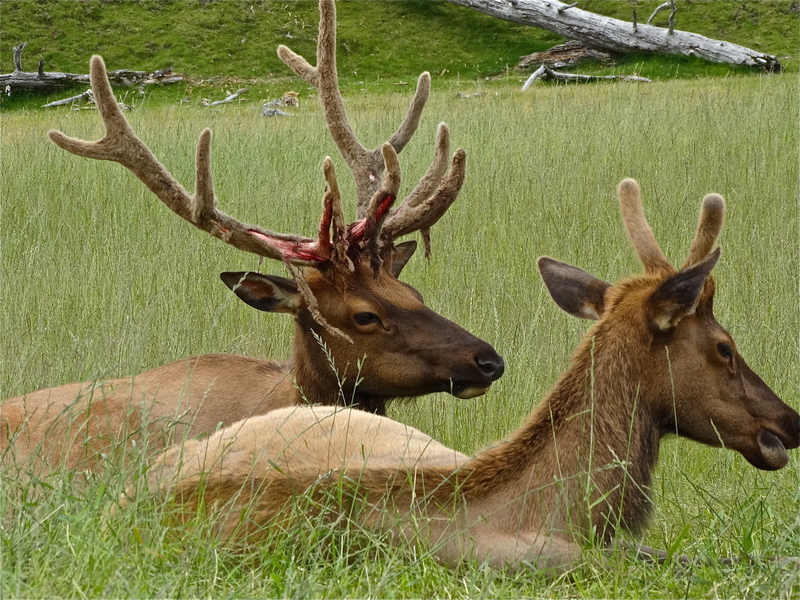 Reindeer buck shedding antler velvet. The grizzlies were the most popular and I spent most of my time watching these beautiful giants. 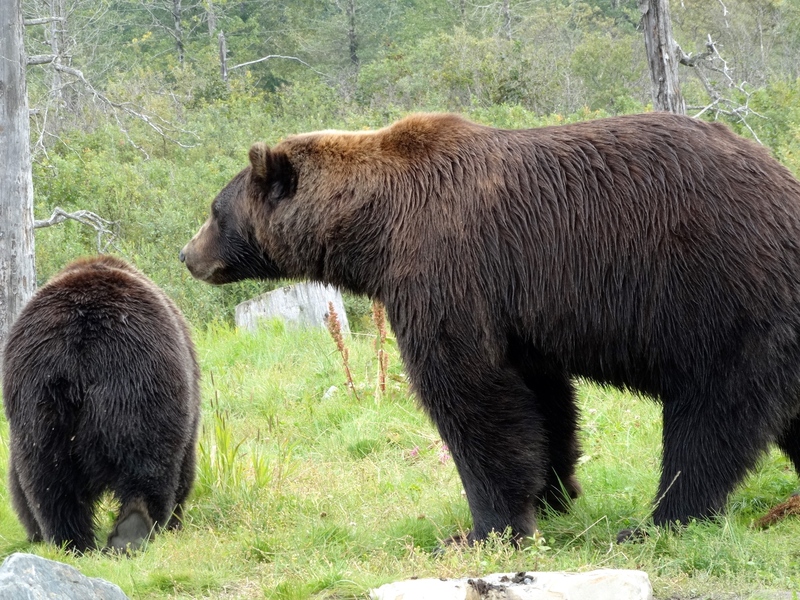 Two of the grizzlies are brother and sister and there is another female with them. When I first approached the grizzly enclosure I only saw the females. I was much impressed with their size, especially after watching their smaller neighbors, the black bears which I have seen in California’s Yosemite Park. But then big brother comes along, a giant among them. 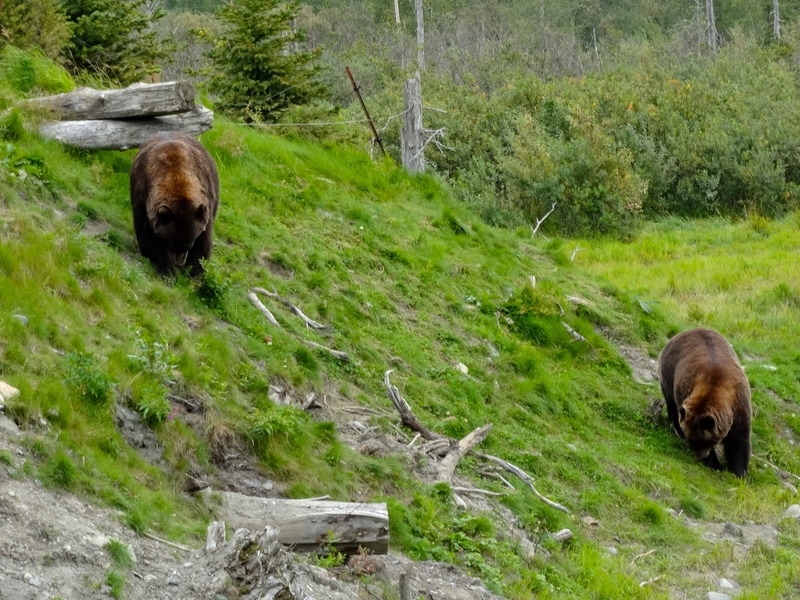 Although I saw a few grizzlies in Denali I was nowhere near this close to them. These are truly impressive animals. Big brother eying the crowd. The two girls looking for a snack. Big brother towers over his sister! 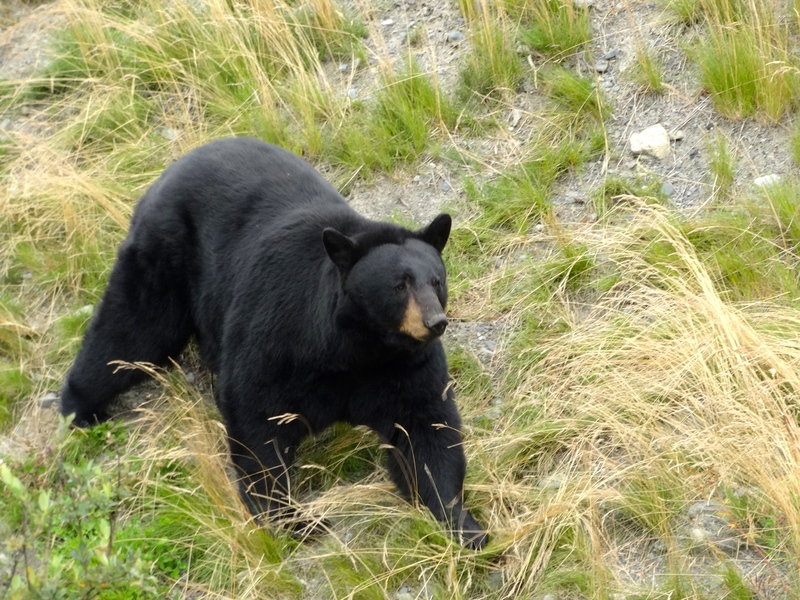 One of the resident black bears. 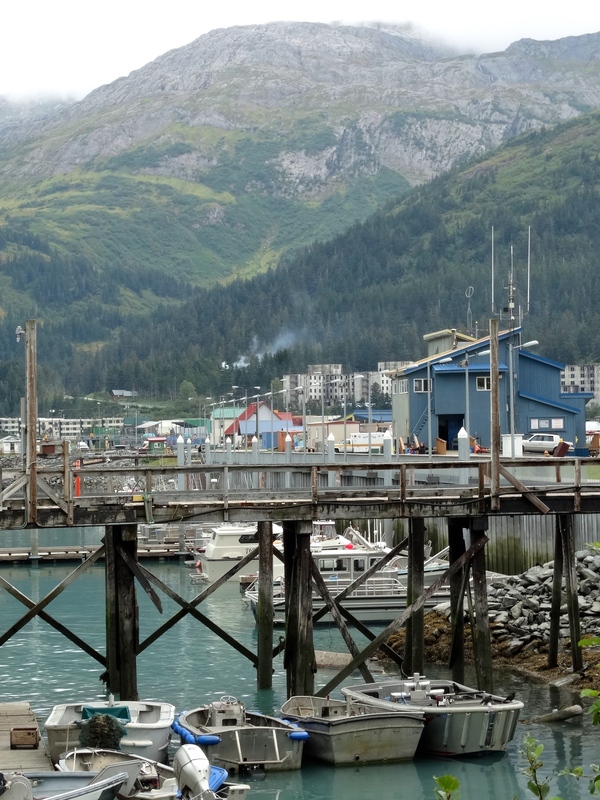 Our next stop was Whittier, Alaska, a tiny town that sits along the Kenai Peninsula. We would only stay for less than 24 hours before picking up the ferry to take us to Valdez. To get to Whittier we had to drive through a 13,200 foot tunnel that is a multi-use road / rail line. It’s only one lane and the traffic queues on each end of the tunnel awaiting an opportunity to pass through. The trains have priority to meet their schedule and the traffic alternates in 15 minute intervals. Once in Whittier, we realized just how tiny this town was. It took us just a couple of minutes to walk through the town of 222 (2013 population). There were only a handful of stores and a couple of restaurants. We were a little surprised to see a cruise ship docked here considering that we didn’t see many other tourists during our stroll. It would be hard to miss a couple thousand cruisers! Later we saw the railroad tracks for the train that picks up the passengers straight from the dock and takes them onto other destinations beyond the town. Waiting in line at the Whittier tunnel. Whittier against a spectacular mountain backdrop. 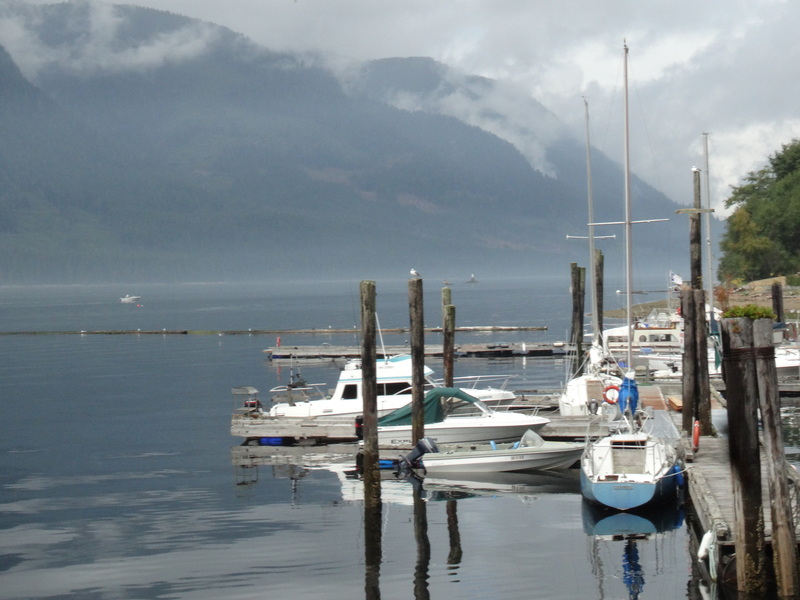 The Whittier marina. I think everyone in town owns a boat! A view of Whittier Glacier from the road behind the town that goes for just a short distance then mysteriously ends. 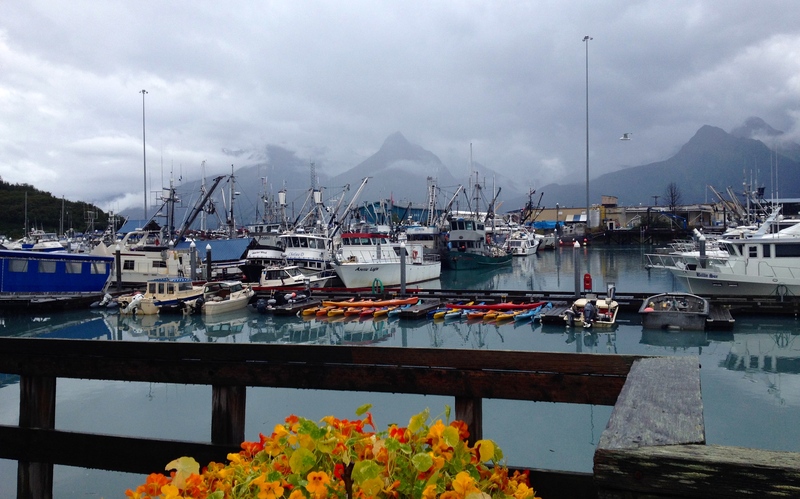 We boarded the ferry to Valdez and spent a rainy couple of days there. After Whittier, Valdez seemed like a small city! It’s the end point for the Trans-Alaska pipeline which moves the oil from the Prudhoe Bay oil fields across Alaska to the port of Valdez. 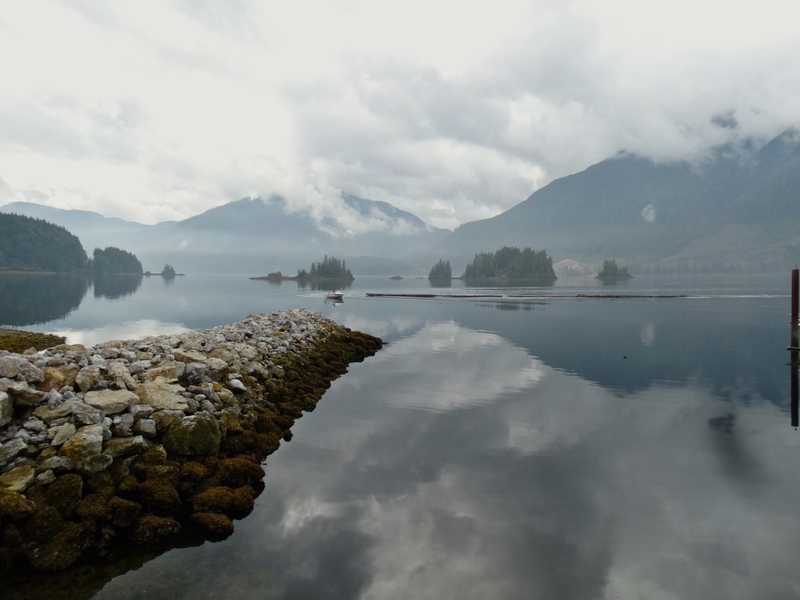 The town made headlines in 1989 when the Exxon Valdez tanker hit a reef, releasing over 11 million gallons of oil into Prince William Sound. “The Atlantic” website has a beautiful photo essay covering the 25th anniversary of the spill titled “The Exxon Valdez Oil Spill: 25 Years Ago Today“. We visited the museum which describes the spill and its continued impact on the environment and the social impact on the fishermen and Native Alaskans whose lives were changed forever by the spill. Exxon fought the $5 Billion dollar punitive judgement against it eventually paying only $507.5 Million. 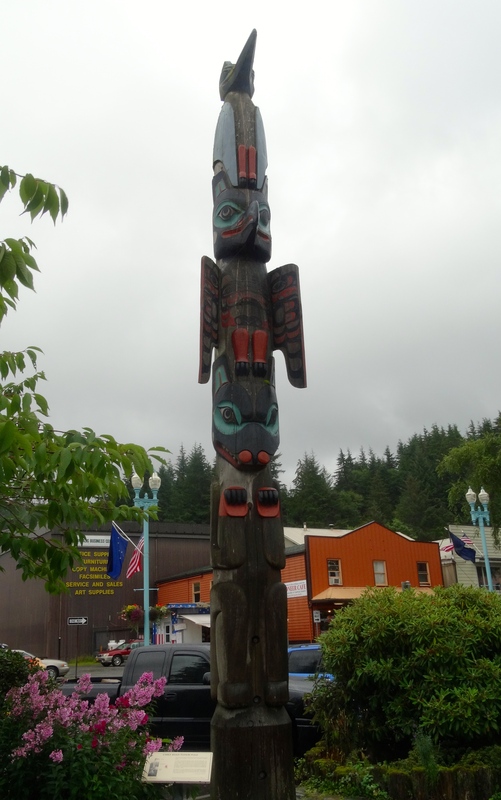 In response, a shame pole has been erected by the Alaskan Natives of Cordova at the Ilanka Cultural Center. We spent some time watching people fishing along the docks in the marina for salmon lost in its maze. 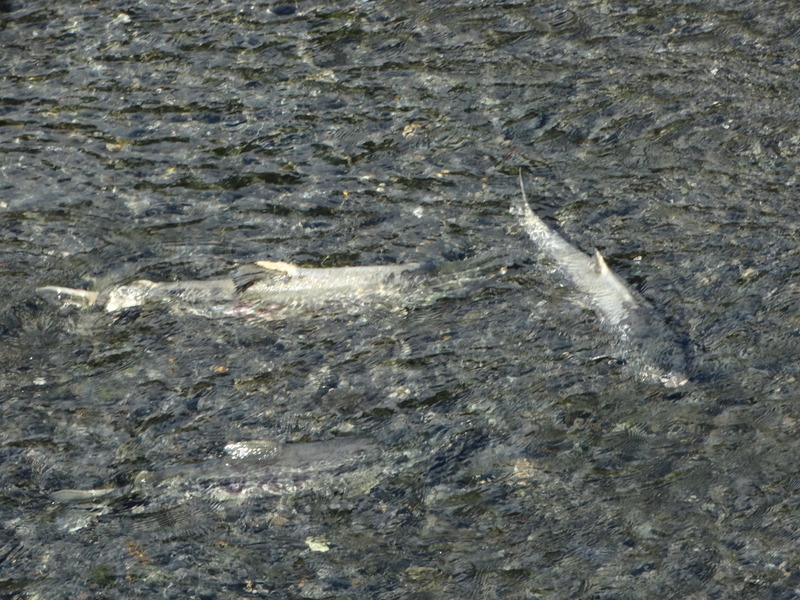 These salmon barely missed the entrance to their native spawning stream and ended up here. It made me incredibly sad to see them here, their epic journey at an end with no hope of achieving their life’s mission. Considering that I have no sense of direction and I could completely empathize with these navigationally challenged individuals. If reincarnation is the way of the universe then I hope that I never return as a salmon considering this would surely be my fate. 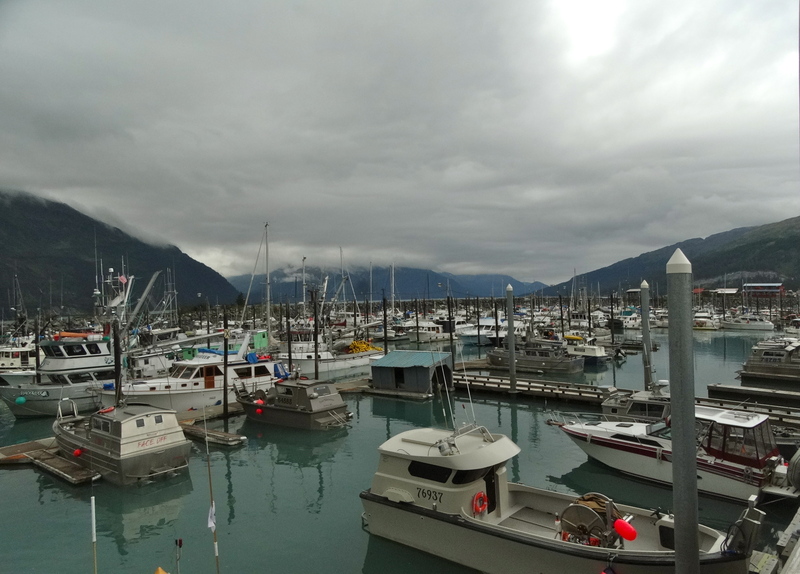 The marina where the journey of dozens of salmon has ended. 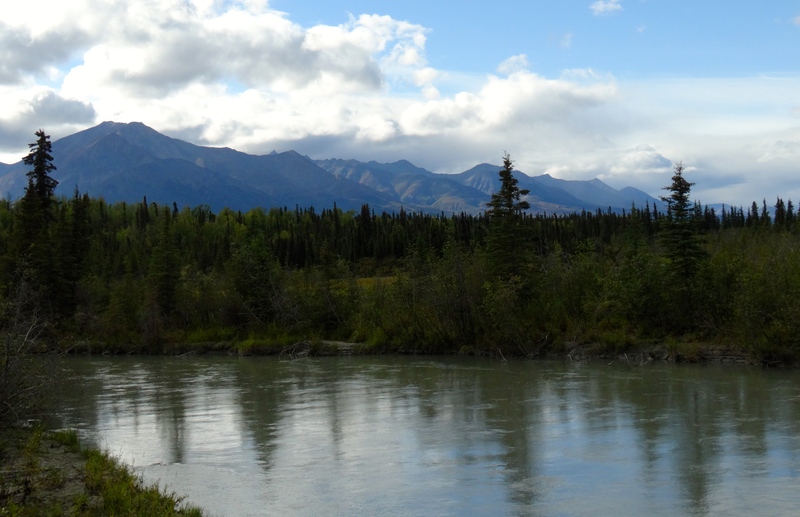 Our time in Alaska was quickly drawing to an end. 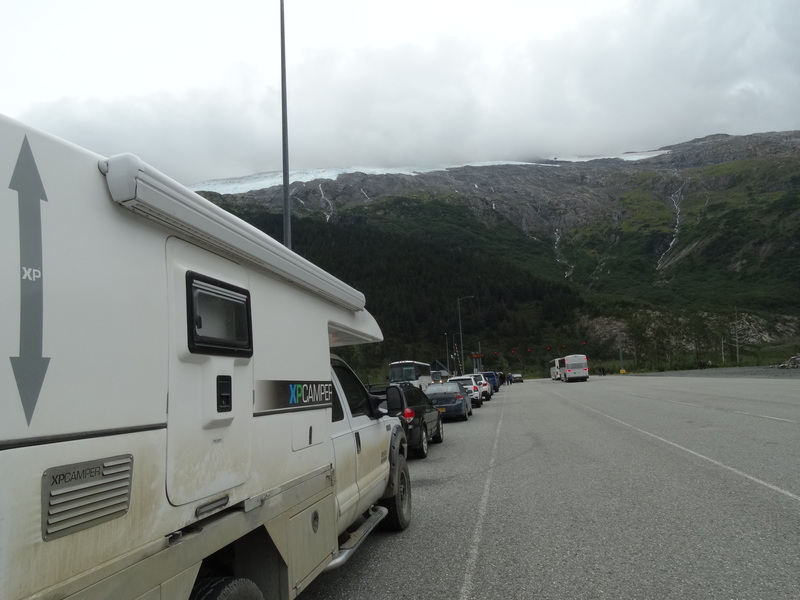 We had a ferry to catch out of Haines in two days and 690 miles to cover in that time. This made for a couple of very long days of driving. The views and incredible landscapes made it an easy journey and one that I didn’t want to end too quickly. We stopped at Crooked Creek in Valdez to watch the salmon spawning in this small stream. We could drive for hours just admiring these views. Oh right…we did!!! We were treated with a glimpse of the fall colors. 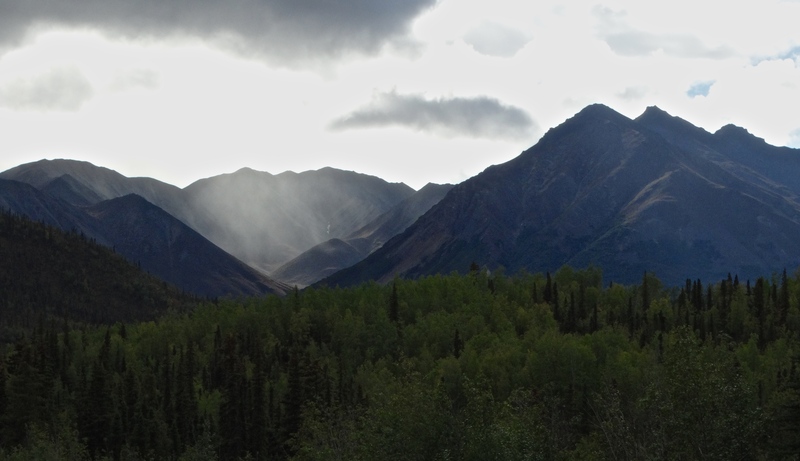 We arrived in Haines, Alaska sometime in late afternoon. Just in time for dinner. Our first stop was the ferry terminal to see if they would let us camp in their parking lot since we would be boarding at 7:30 am which means they expect you in line by 5:30 am. We got the ok then we found something to eat. 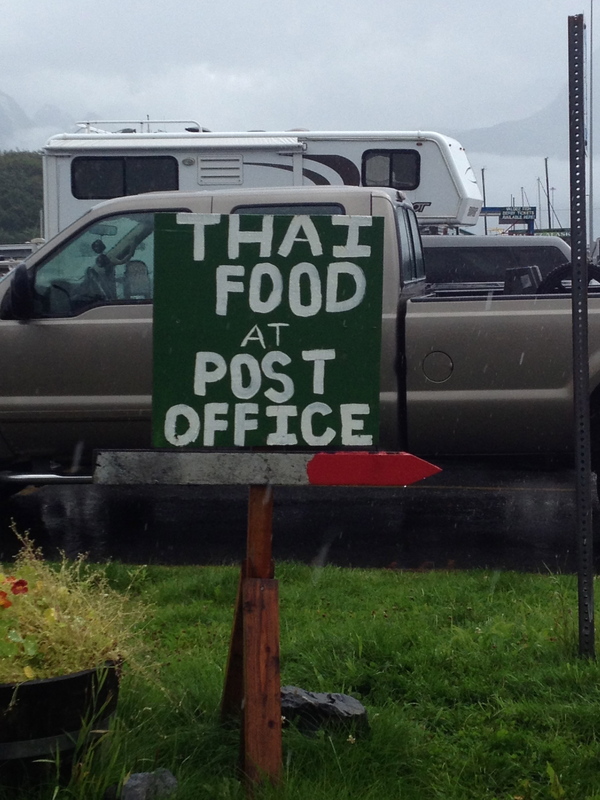 It’s been a lot of fish ‘n chips and hummus throughout Alaska and today wasn’t any different. As you can probably imagine, there are not a lot of fresh fruits and vegetables to be found but surprisingly, we consistently found that the restaurants were out of salmon! Go figure?! After dinner we drove around the town for awhile and we were lucky enough to see two more bald eagles. 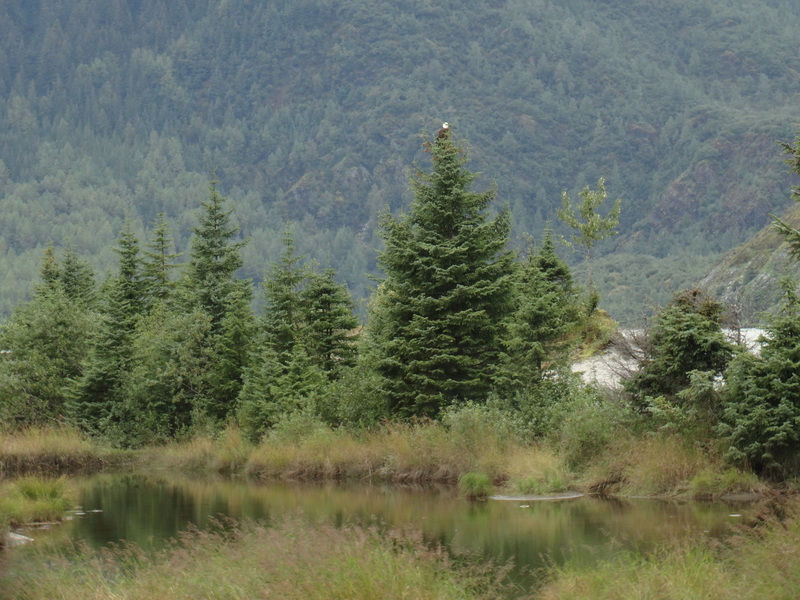 The guide books say that there are bald eagles everywhere in Haines although we saw just these two. Given our very limited wildlife sightings we weren’t surprised that we didn’t see many bald eagles. Maybe when we return some day the eagles, bears, wolves, foxes, salmon, and others will reveal themselves to us. 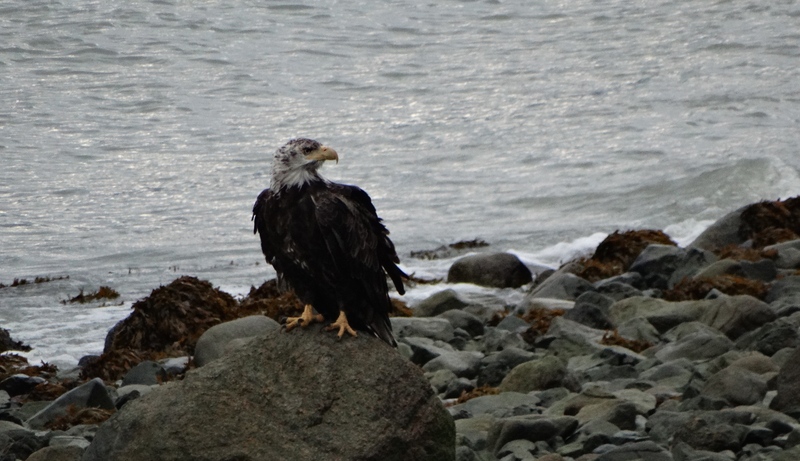 This was a scrappy looking bald eagle but I was delighted to see him! 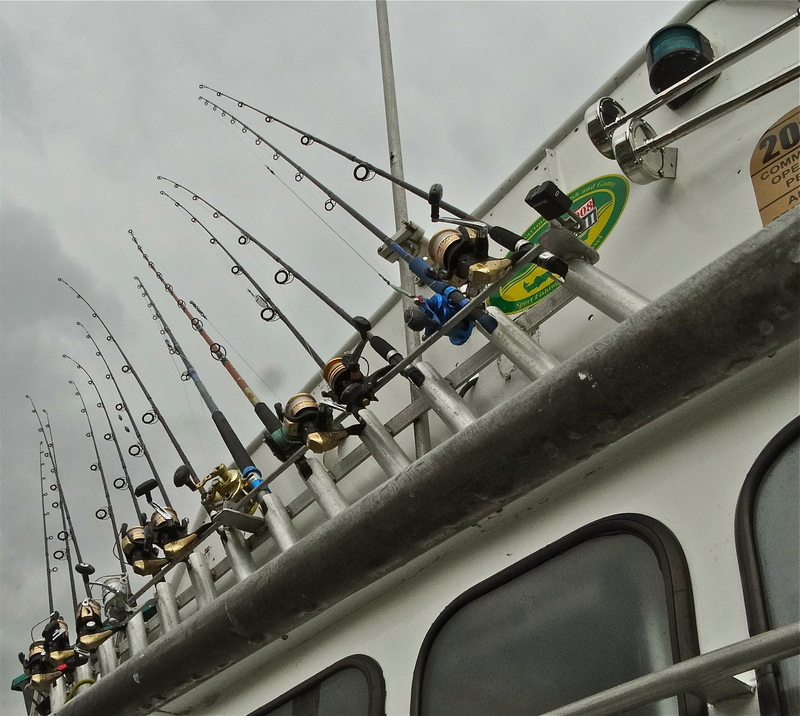 We boarded the Alaska Marine Ferry for our second time through the Inside Passage. 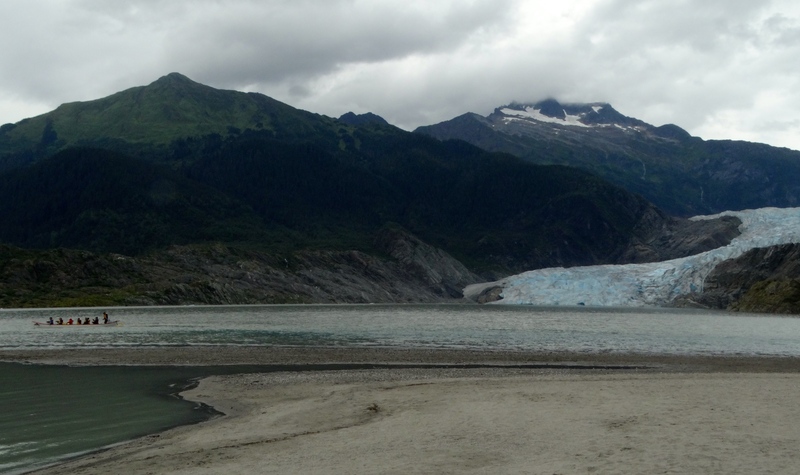 This time through we would be in Juneau for a few hours; just long enough to go see the Mendenhall Glacier. Unfortunately, we didn’t have enough time to do the hike to get closer to the glacier but the views from the visitor center were wonderful. Nugget Falls, some distance to the right of the glacier ran directly under the glacier until the 1970’s. 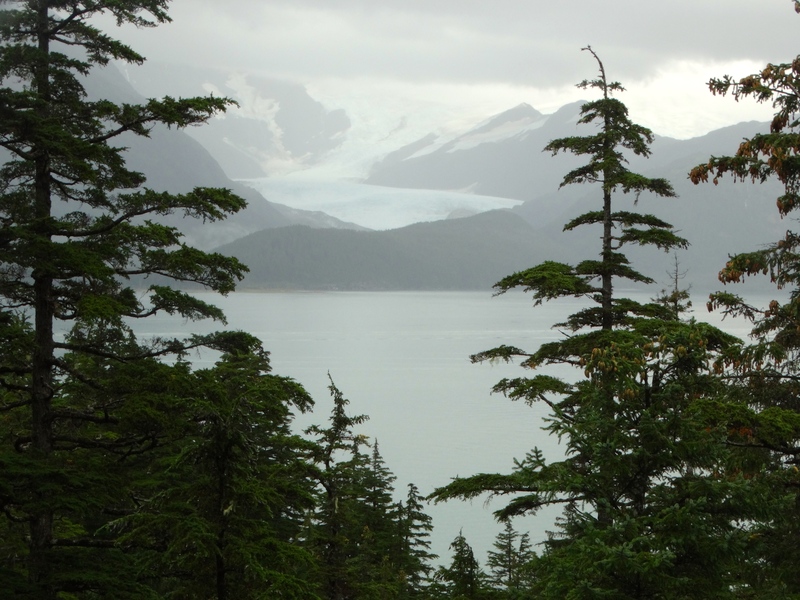 You can see from the photo below that the glacier has retreated quite a bit from those earlier days. 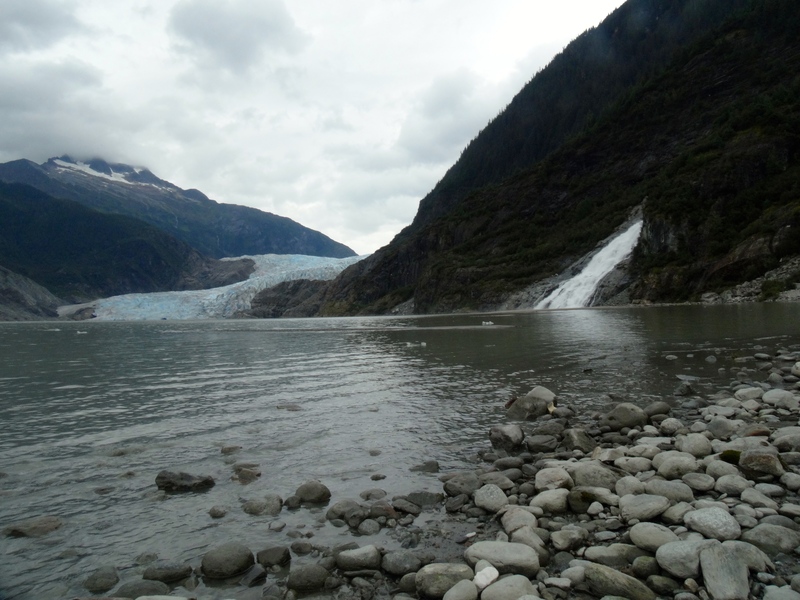 Check here for a chronology of the glacier’s retreat along with some photographs of the glacier from earlier times. 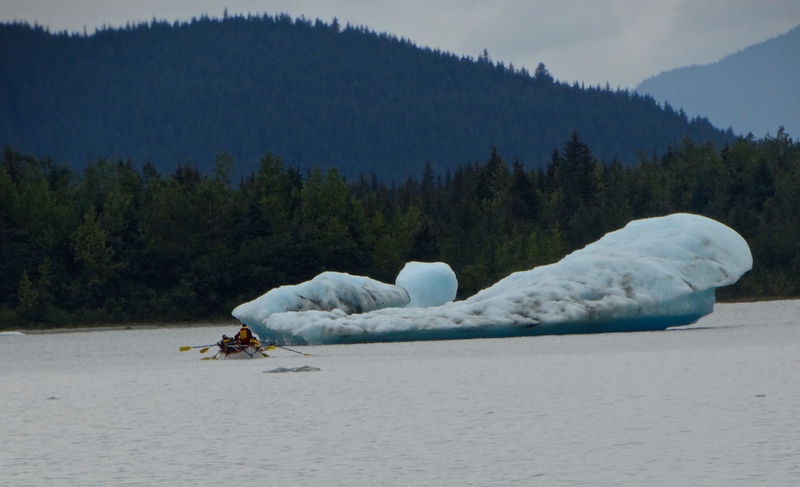 A group of kayakers floating past an iceberg from Mendenhall Glacier. See the bald eagle at this top of the tree?! Here is a close-up of the eagle in the treetop. 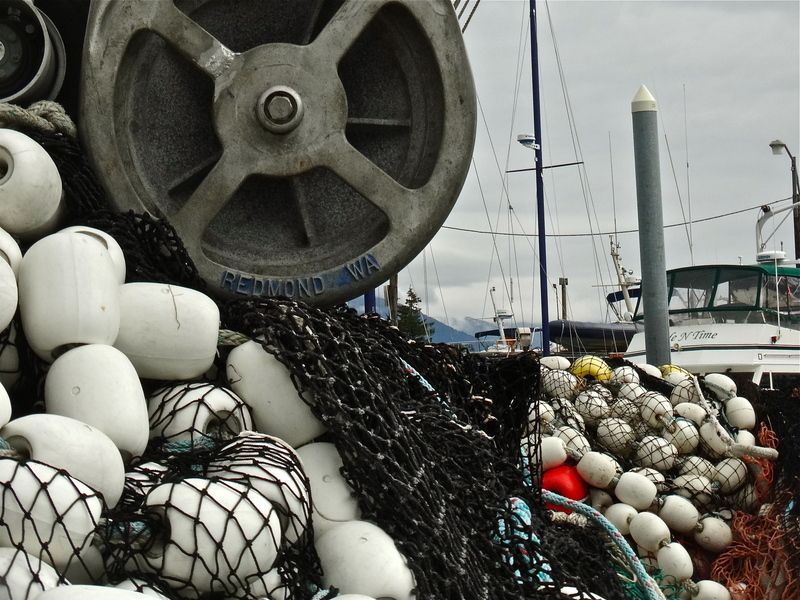 Ketchikan was the next town that we visited during our trip through the Inside Passage. It was a very wet walk into town to the visitor center where we picked up a map of the town’s totem poles. We visited the Totem Heritage Center where salvaged Tlingit and Haida totem poles were on display. 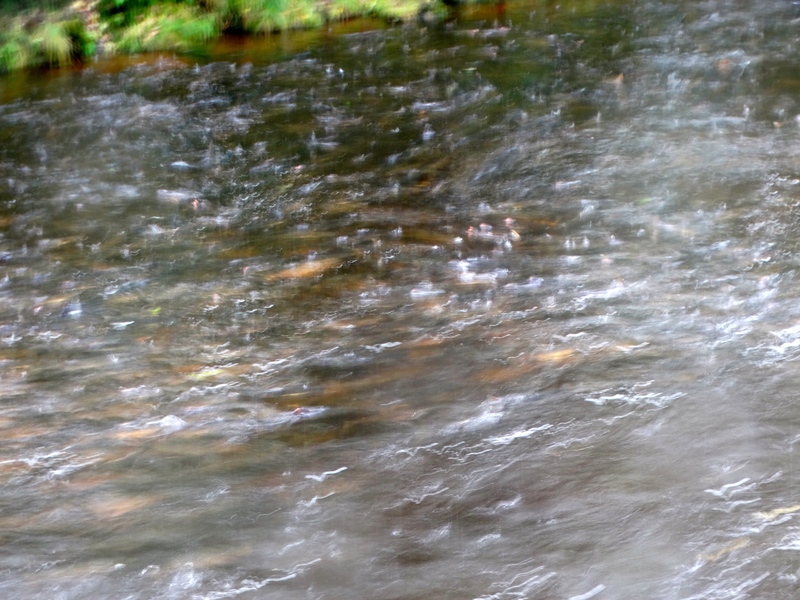 As we passed over Ketchikan Creek Darryl noticed a group of salmon in the waters. 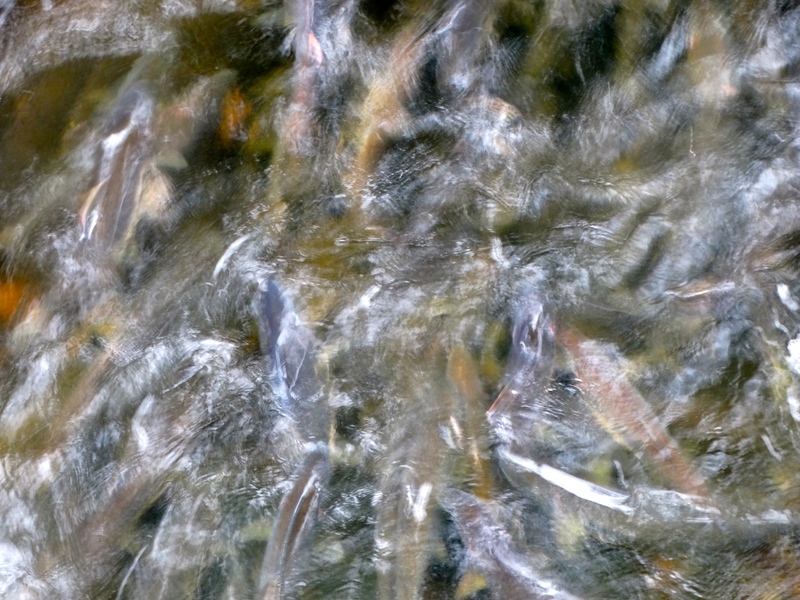 As we looked closer we noticed that the whole creek was packed with hundreds of salmon! It was the most amazing sight seeing the creek literally shimmering with life. 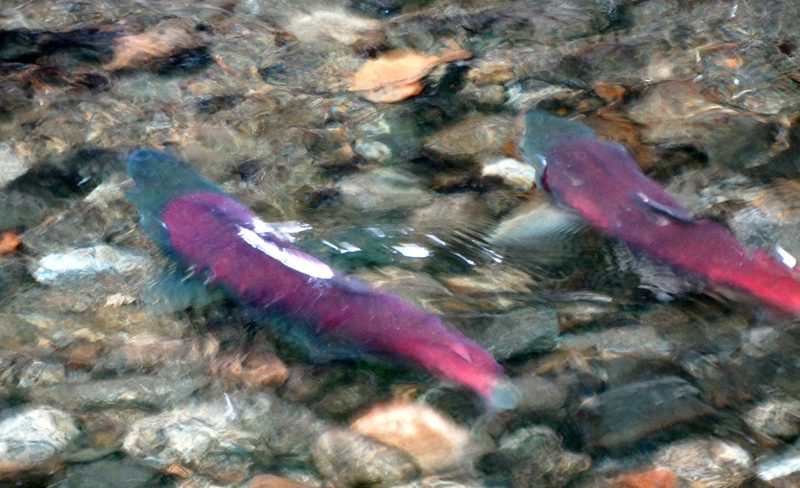 A close-up of the salmon in Ketchikan Creek. All of those shapes that look like stone are actually salmon. Our time in Alaska has drawn to a close and our wild, beautiful adventure in this beautiful State was more spectacular than I expected. 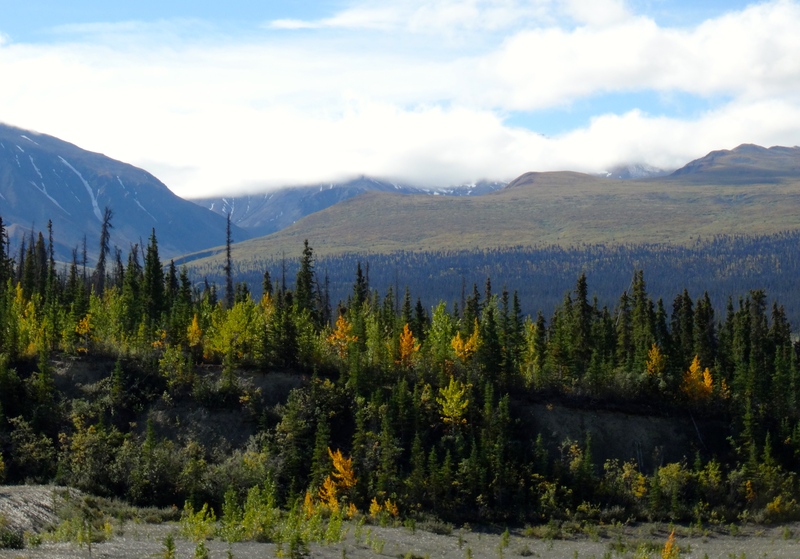 We are so grateful for this opportunity that we have to make this epic journey and we definitely made the right decision when we added Alaska to the itinerary.